The joint submarine rescue exercise took place during Rim of the Pacific 2016 off the coast of Hawaii. The People’s Liberation Army Navy (PLAN) and U.S. Navy conducted a joint submarine rescue drill on July 13 as part of the 2016 Rim of the Pacific (RIMPAC) naval exercise, held biennially in June and July of even numbered years in waters around the Hawaiian Islands and southern California. 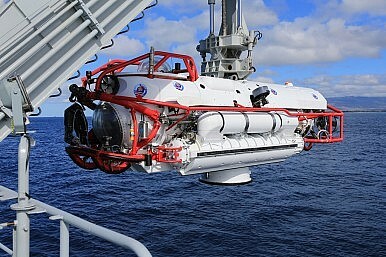 The practical exercise involved the Dalao (Type 926)-class submarine rescue ship Changdao of the PLAN’s South Sea Fleet and U.S. Navy submariners who, aboard the Changdao, participated in launching a LR7 deep submergence rescue vehicle. According to a U.S. Pacific Command press release, Chinese and U.S. sailors successfully launched the rescue vehicle and conducted a successful mating with a faux-NATO rescue seat. Deep submergence rescue vehicles are designed to rescue personnel from disabled submarines. They do so by attaching themselves to the hull of the submarine and land on a so-called rescue seat—the submarine’s escape/rescue trunk, through which crew members of the disabled boat can be evacuated. Participants of the drill noted that it confirmed that the PLAN and U.S. Navy can jointly conduct a rescue exercise in the event of an accident. “This exercise was an important part of China’s participation in the RIMPAC-2016 multinational maritime exercise,” China Military Online states. For the 2016 iteration of RIMPAC, the PLAN dispatched a guided-missile destroyer, a guided-missile frigate, a hospital ship, and a replenishment vessel, along with the submarine rescue ship Changdao. The world’s largest international maritime exercise will conclude on August 4. The exercise encourages partnership and understanding but also shows off important new capabilities.